Two types of type Ia supernova? Authors: Ryan J. Foley et al. You probably heard that the 2011 Nobel Prize in Physics went to Perlmutter, Schmidt, and Riess for their discovery of the accelerating universe. You might even know that they measured the universe’s expansion with type Ia supernovae. We can estimate the luminosity of these so-called standard candles very precisely and thus infer how far away the supernova is. However, one outstanding question discussed in a previous astrobite is, “How standard are standard candles?” If we have overlooked a process that allows some type Ia supernovae to be brighter than others, there are inherent errors in our measurement of the universe’s acceleration. 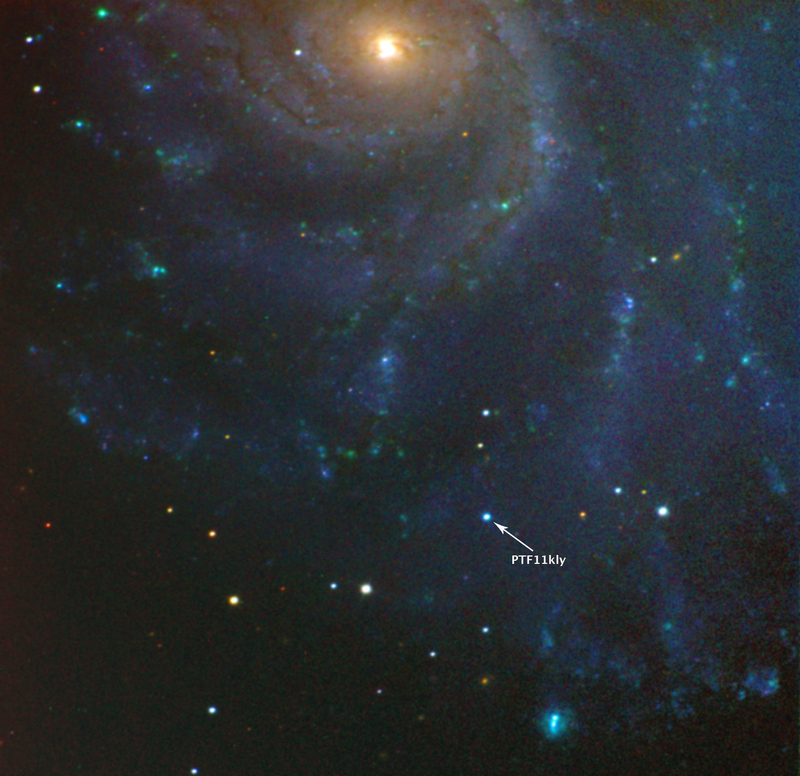 Two different populations of stars might lead to type Ia supernovae. The two different progenitor systems are classified as single-degenerate or double-degenerate. A single-degenerate system includes a white dwarf orbiting another star at such a close distance that the white dwarf’s gravity strips gas from the other star. The gas forms an accretion disk around the white dwarf as it spirals onto the white dwarf’s surface. Eventually, the mass of the white dwarf exceeds the Chandrasekhar limit, and the white dwarf can no longer hold itself up by electron degeneracy pressure; it explodes in a type Ia supernova. A double-degenerate system consists of two white dwarfs that collide, creating a type Ia supernova. So how can we tell these two progenitor systems apart from the properties of a type Ia supernova? Ejection velocity (increasing from botton to top) versus pseudo-color (red to the right). The blue-shifted (blue circles), red-shifted (red squares), single-symmetric (purple diamonds) and no-absorption (yellow triangles) are plotted along with supernovae from a previous study by Foley, Sanders, and Kirshner (black plusses). Points inside a black circle showed variable sodium D lines, which has previously been associated with high-velocity explosions. The blue-shifted sodium D population and the variable sodium D population both occupy the top right corner. Figure from Foley et al. Is the circumstellar sodium D absorption line blue-shifted? The authors examine the sodium D region of the spectrum for narrow absorption lines in addition to the host galaxy’s sodium D line. Because supernovae happen in galaxies, a spectrum of a supernova also contains information about the host galaxy, and it is critical to disentangle the two. Future work has found that some supernovae exhibit variable sodium D absorption lines. Because galaxies change on extremely slow timescales, their spectra do not vary; therefore, the variale sodium D line must come from the region around the supernova. The supernova’s sodium D line is blue-shifted, red-shifted, or symmetric (i.e. indistinguishable) relative to the host galaxy’s sodium D absorption line, or the host galaxy has no reference sodium D line. Previous studies have shown that many more supernovae have blue-shifted than red-shifted circumstellar sodium D lines, indicating that there is a population of progenitors characterized by strong outflows relative to the host galaxy’s velocity. 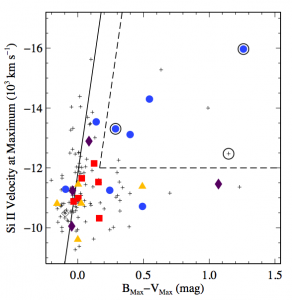 This study agrees, finding 6 supernovae with red-shifted and 10 with blue-shifted lines. Blue-shifted: indicates either strong outflow from progenitor or statistical deviation due to interstellar medium. Red-shifted: indicates either inflow into progenitor or statistical deviation due to interstellar medium. Single/symmetric: indicates weak or no outflow from the progenitor. No absorption: host galaxy lacked sodium D absorption line. Going back to single- versus double-degenerate progenitors, we might expect the the single-degenerate system, which requires the white dwarf to slowly accrete matter from its companion, to develop outflows, whereas the catastrophic merger scenario of the double-degenerate case would not have time to form a steady outflow. Does the light curve have a red pseudo-color? The authors measure the magnitude in the blue (B) filter at the time of maximum brightness in the blue filter minus the magnitude in the visible (V) filter at the same time. After a correction for galactic extinction, this serves as a proxy for the extinction due to circumstellar material and is thus a good indicator of gas around the supernova. Higher B-V (redder): progenitor lived in a gas-rich environment. Lower B-V (bluer): progenitor lived in a gas-poor environment. Because a single-degenerate system involves the white dwarf messily acquiring the gaseous outer layer of its companion, this would lead to a supernova in a gas-rich environment. White dwarfs are very gas-poor objects (they are basically giant balls of carbon), and so the double-degenerate scenario does not involve a gaseous environment. Is the supernova’s ejection velocity unusually high? The authors measure from the red-shift of the Silicon II line at the time of the supernova’s maximum brightness and use the Doppler formula to convert this to an ejection velocity (i.e. energy per unit mass). This is the velocity (about 12,000 km/s) of the supernova’s explosion front, and it is completely different from the progenitor outflow velocity measured in the blue-shifted sodium D lines, which results from the comparatively lethargic dribbling of gas from the progenitor. Higher velocity: more energetic explosion! Normal velocity: explosion was pretty meh (by supernova standards). It is not obvious to me whether the single- or double-degenerate supernova would produce a more energetic explosion. In this study of 23 supernovae, the authors find that those with blue-shifted sodium D lines tend to have redder pseudo-colors and higher ejection velocities than those with other types of sodium D absorption. The blue-shifted sodium D line is associated with outflow from the progenitor, the red pseudo-color is associated with a gaseous circumstellar environment, and the higher ejection velocity is associated with a more energetic explosion. Although there is definitely a link between strong outflow from the progenitor and a high explosion velocity, the authors posit two possible interpretations. This could be because supernovae are asymmetric explosions in which the explosion is aligned with the direction of outflow from the progenitor, or because there are two different progenitor populations. Because we can only observe a supernova from one direction (Earth), we cannot immediately distinguish between these two interpretations. If there are two progenitor populations, the population in a gaseous environment with strong outflows hints at the single-degenerate scenario in which gas spirals from the star onto the white dwarf as an accretion disk, and outflow is possible along the poles; the population in a gas-poor environment with no outflows could be the double-degenerate scenario. Either way, we might need to revisit our interpretation of cosmic distances and the expansion of the universe.